Randomly inserted into packs of 1998 Donruss Signature were Significant Signatures inserts, which featured beautiful on-card autographs of legends such as Yogi Berra, Eddie Mathews, Ernie Banks, Stan Musial, and Phil Rizzuto, just to name a few. 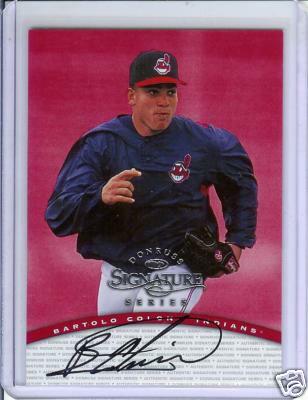 Each card was limited to 2,000 copies, with the exception of Rizzuto, who only signed 1,000. However, not all the cards were directly inserted into packs. Redemption cards were created for Sandy Koufax, Ozzie Smith, and Nolan Ryan. The redemptions (which had to be redeemed before the year 2000) were for special signed REFRACTORS with a print run of 2,000. However, some time after the product’s release, non-refractive versions of these three cards were found. They featured different photographs from their refractor counterparts, but still looked very sharp in basic foilboard. While Koufax and Ozzie once again had 2,000 cards out there, there were only 1,000 of the non-fractor Nolan Ryan card. Oh, and if you’re reading this Jason, this Ryan is your prize for winning the contest. Congratulations and enjoy! A few quick notes: the Fan Favortes relic looks really strange in the scan. The “gray” bars at the top and bottom of the card are actually a dark red color. The card also has a refractor-like finish and is numbered to just 25. The Century Marks card has a print run of 100 and was one of my most wanted cards. Despite the fact that 100 copies are the quivalent of say 1,000 copies by today’s standards, these cards still go for quite a bit of scratch. A Tony Gwynn recently ended for $85. There are several others in eBay stores with price tags of $25/ea. per common player. I paid $36 for my Paul O’Neill card, which was a little more than my ideal price. Given the fact that these cards rarely pop up (and he was a Yankee during their last “dynasty”) though, it certainly could’ve been worse. The final card came from Dave of Fielder’s Choice. I already posted about this card on my other blog here, but I figured I’d post it here also (sorry for the weird cropping) because it features my favorite player and because Artifacts hockey isn’t nearly as much of an eyesore that Artifacts baseball is. I’ll save that rant for another time though. I’ve decided to add a brand new feature here which will display some of my personal collection while keeping with the blog’s theme: Old School Hits. In this feature, I will be displaying autographs and game-used cards from the year 2000 and back (before the GU situation got out of hand). Just a note, all cards displayed here will be cards I actually own, unless noted otherwise. Some cards will also be available for trade. I’ll let you know which ones. Anyway, with the 1997 love going around, I thought I’d start off with something from that year: a 1997 Donruss Signature Millennium Marks autograph of my favorite player, Paul O’Neill. Yes, he used to be thin! 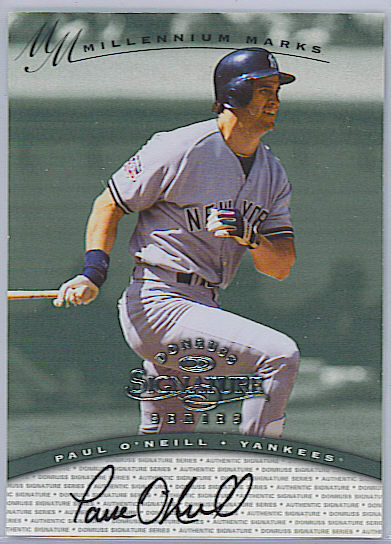 My Paul O’Neill card is not shortprinted and is stamped as number 0113 (out of 1000). Feedback on this new feature is appreciated and as always, thanks for reading!